Let us know what number(s) you'd like. Generally 1 digit number fits best on 1", two digit numbers on 1.25" and Three digit numbers on the 1.5" If you have a special request - please message us. We are offering something a bit different and using only authentic vintage and antique punch sets from our personal collection to make these unique hand stamped metal tags! If your looking for that tough to replicate authentic look that just can’t be reproduced with mass produced new punches you have found it! 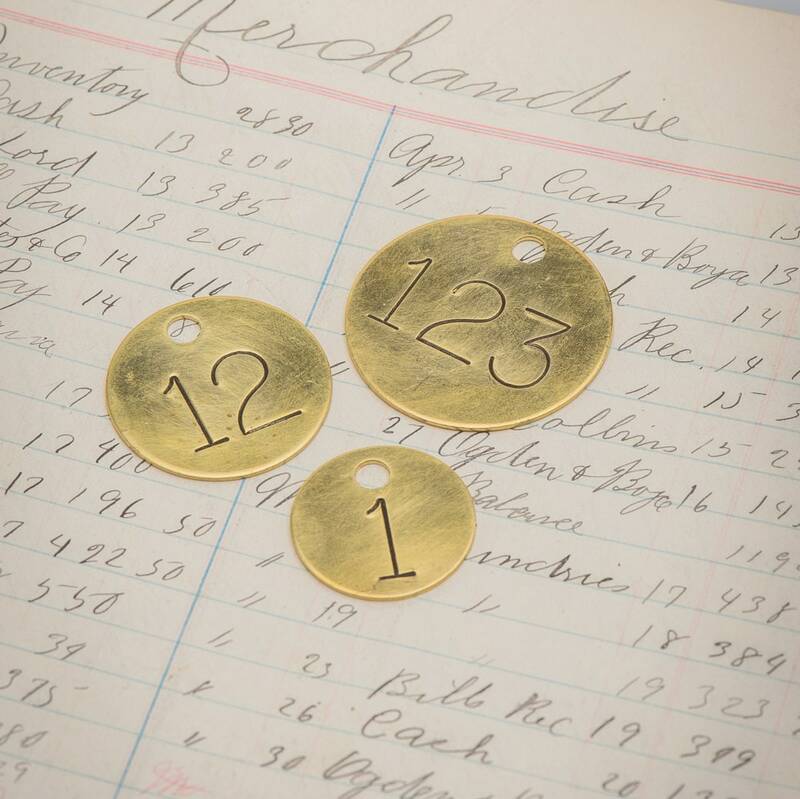 These beautiful round high quality brass tags are hand punched and hand buffed for a look that is one of a kind. Characters are punched with a rare set of HUGE 5/8” tall tools. See the last photo for details on this set. We have all letters and numbers in this authentic vintage set. So cool! These made with a variety of different sized round tags. A high quality 1" round brass split ring can also be added. See photos for details. 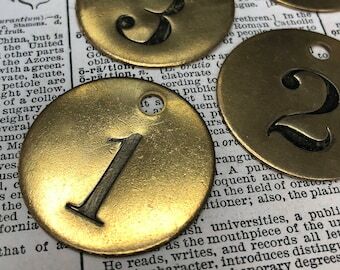 These brass tags are perfect for key fobs, hotel key tags, valet or coat check tags, pet ID tags, the list goes on and on. We have made entire sets of coat check and hotel key fobs for several properties so the sky is the limit. We have made thousands of hand punched tags for satisfied customers around the world. We are self proclaimed experts but keep in mind these are not machine made and will have the variations and slight imperfections you would expect from an authentic hand made product such as this. Thank you! This was an anniversary gift for my husband's key chain. as described , thanks so much . Got just what I ordered, very fast smooth and easy transaction, would highly recommend and order from again. I do accept returns within 14 days. You will be responsible for return shipping costs. Shipping charges will only be refunded in the case of lost or damaged items. If you have any questions about an item please ask before purchasing. Most items will ship the next business day via USPS First Class or Priority Mail. Large items will be shipped parcel post. A tracking number will be sent once an item has shipped.